Saint Lucia celebrates Independence Day. Although it became an independent country in 1979, it is still part of the British Commonwealth. According to the CIA World Factbook, Saint Lucia is about 3.5 times the size of Washington, DC. The island, located in the Caribbean Sea, exports bananas and cocoa. About 160,000 inhabitants live on the island, and many of them depend on tourism for income. Castries is the capital. Florida became a part of the United States in 1819. The Adams-Onis Treaty, also called the Transcontinental Treaty, the Florida Treaty, and the Florida Purchase Treaty, defined the border between New Spain and the United States. The treaty took effect July 17, 1821. Spain gave the land to the United States if the United States assumed five million dollars of claims of American citizens against Spain. Robert Baden-Powell (born London, England, 1857; died Nyeri, Kenya, January 8, 1941) established the Boy Scouts and Girl Guides. Frederick Chopin (born Zelazowa-Wola, Poland, 1810; died Paris, France, October 17, 1849) was a classical pianist and composer. He created more than 200 pieces for the piano as well as chamber music and orchestral arrangements. He played his first concert at age eight and began composing after that. He spent most of his adult life in Paris. He died of tuberculosis. His works, influenced by his Slavic background, are full of melody and rhythm. Elisha Cooper (born United States, 1971) writes and illustrates books for children. In 2018 he earned a Caldecott Honor Award for Big Cat, little cat. Children can learn more at: http://www.elishacooper.com/. Edward Gorey (born Chicago, Illinois, 1925; died Hyannis, Massachusetts, April 15, 2000) was an author and illustrator. He provided the odd illustrations in the books by John Bellairs and Brad Strickland. Children could learn more at: Edward Gorey. Rembrandt Peale (born Bucks County, Pennsylvania, 1778; died Philadelphia, Pennsylvania, October 3, 1860) was a painter, mostly of portraits. He was a member of the artistic and famous Peale family. Children could view a number of his works at: Rembrandt Peale. Horace Pippin (born West Chester, Pennsylvania, 1888; died West Chester, Pennsylvania, July 6, 1946) was a painter. The grandson of slaves, he injured his right arm during battle in World War I. After the war, he returned to the United States and worked at various jobs. He developed his artistic talents and became a famous folk artist. Children could view a number of his works at: Horace Pippin. George Washington (born Westmoreland County, Virginia, 1732; died Mt. Vernon, Virginia, December 14, 1799) was the first president (1789-1797) of the United States. He fought in the French and Indian War as an officer of the Virginia militia. He led the Continental Army to victory during the American Revolution. He helped organize the new country by presiding over the Constitutional Convention. He was elected president unanimously by the electoral college twice. He refused to run for a third term. 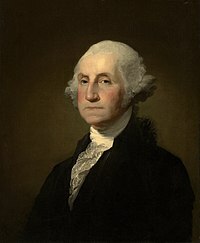 He has been called “The Father of Our Country.” Children could visit a website at: George Washington.